He's an old romantic is Boatrocker main man Matt Houghton. Well, not that old, but certainly romantic. Not just in the sense of being keen to pay homage as respectfully as possible to the European brewers from whom he takes inspiration, but sometimes in the naming of his beers too*. Case in point is Gaston, the Chardonnay barrel aged, gently soured, 9 percent ABV saison that's become something of a sleeper hit for the brewery. 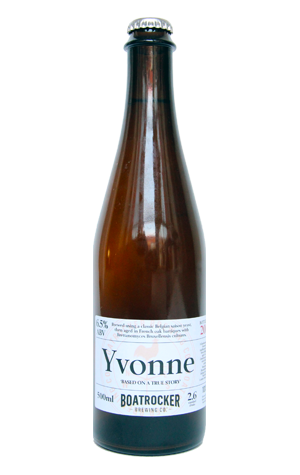 The beer is named after one of Matt's late, great uncles, and now Gaston's sister, Yvonne, gets a beer named in her honour too. The naming makes sense in that the beers share similarities in concept and production, with this new release the lighter, fairer of the two. What that means is a beer with aromas of lemon citrus and soft, bready, honey malts and flavours of subtle and changing complexity: bitter orange flavours give way to a Riesling like dry, minerally, vinous, lemon-lime acidity – an acidity that's more pronounced than in the fuller Gaston – with a peppery spiciness arriving late on. Taken together with her brother, Yvonne makes for a lovely pair. *Almost forgot: there was the time he told the packed room that "Love is the answer" when collecting the AIBA 2015 Champion Brewery trophy too...!